If someone is to ask me now what I think is the national food of Singapore, I would be keen to say it’s ‘anything salted egg’ whether it’s salted egg chicken, salted egg prawns, salted egg squids or salted egg crabs. These days, we could even get salted egg croissants, salted egg tarts, salted egg potato chips, salted egg fish skins, salted egg ice cream, salted egg donuts and the list goes on and on. 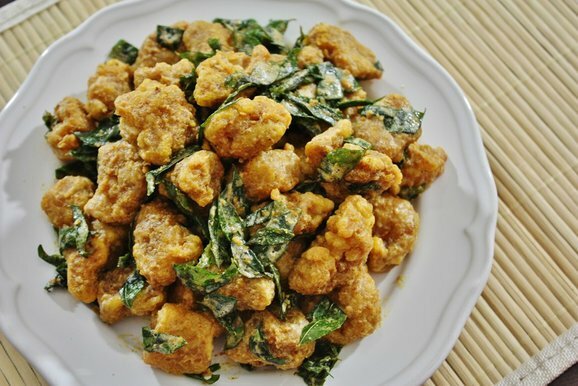 Salted egg to me is a comfort food and this Salted Egg Chicken recipe never fails to make my husband swoon over it because the smell of the salted egg yolks just makes us salivate and one bite is good enough to have us hanker for more. I like my version with lots of crispy curry leaves that are just so aromatic. Do you? Marinate chicken with egg, salt and pepper. Dredge chicken pieces in tapioca flour, shake off the excess and transfer onto a clean dry plate. Deep fry the chicken in batches till golden brown and crispy. Drain and transfer onto paper towels to remove excess oil. For the salted egg yolk sauce, heat olive oil in a separate pan and melt the butter till the mixture turns foamy. Pan-fry the curry leaves till crisp and fragrant. Add the salted egg yolks and cook till the mixture becomes bubbly. Reduce heat and add evaporated milk and a pinch of salt. Return the fried chicken to the pan and toss till evenly coated. Hi! can i ask if there’s an alternative to steaming the egg yolks? Hi Esther, you can just boil the salted eggs in whole (like how you’d do for hard-boiled chicken eggs) and then remove the yolks from the whites. Works the same. Cheers! It would be great to make a video of it!! Hi, may know where to get salted egg yolks by itself in singapore? Or do u have to buy the whole egg and seperate them? Hi, I’ve never seen salted egg yolks being sold on their own so yes, I would say buy the whole eggs and separate them yourself which is really easy to do. Cheers. Just cooked it today. Best recipe ever! The chicken taste so great and I’m definitely going to cook it again real soon. No need to eat from outside anymore coz this is better than outside ones. Thanks so much for sharing! Most if not all markets would sell salted eggs at the egg stalls so shouldn’t be a problem to get them. Otherwise, all supermarkets will have them too. Cheers. Theu do sell only the salted egg yolk .. Market ..
Hi Geri, can i ask what type of butter you use? Cause few months back i tried cooking salted egg chicken and failed badly!! I melted the butter(Emborg Unsalted) on my pan and tried to mix with the yolk for less than a min, the whole mixture got burnt!! The fire level that i set is low thou…Or will adding olive oil helps to prevent my mixture from burning? Hi Chan, the butter you use is fine but do note butter has a low heating point so if you don’t add oil (olive, canola, sunflower, peanut or coconut oil works fine), it will burn very quickly in your pan regardless whether you put on low heat or not. Give it a try again and see how it goes. Good luck! Thanks for the reply. I will try it out again. No problem. Hope it works for you this time. Let me know how it goes. Cheers. Like to check, the salted egg that you bought is those cooked type? At the supermarket, I saw only those salted egg, covered with black coating outside. Where can I get those Fresh salted egg? Kindly advise. Hi Grace, those covered with black coating from the supermarket or wet market are fresh salted eggs. The ones I use are exactly that and you just need to cook them to extract the yolks. Cheers. it is better if you could get those salted eggs covered with soil. Extract the yolk out of it then steam. This help to add a bit moist to eggs so it wont be feel dry and easily burnt and it make a perfect foamy bubbly finish with that moisture. Hi just came across this recipe. Any alternative if I don’t have tapioca flour? Thanks! Hi, the closest alternative is probably potato flour because corn flour or plain flour doesn’t really give the same crisp as tapioca flour when fried. I would still strongly recommend tapioca flour rather than substituting it for something else. Cheers. Hi there! If I were to use this recipe for potato chips, would the sauce make the chips turn soggy? I read that it’s better to use salted egg yolk powder but I’ll probably have trouble getting that. Thanks!! Hi, my recipe is the dry version, it’s not really a sauce that can drench. It doesn’t matter whether you use powder or fresh yolk because it’s the amount of liquid (oil, butter, evaporated milk) you add that will affect the crispiness of the ingredient you’re using. Hope this helps. Cheers. Hi i just came across this recipe. Any alternative for the evaporated milk? Hi, you can use regular milk (I would suggest skimmed milk as its flavour is milder) or just omit the evaporated milk from the recipe. Can use normal salted egg instead of duck,wats the difference? The standard salted eggs that we can get from supermarkets or wet markets here are duck eggs. Hello! Need clarification for Step 4. Once the olive oil is heated up, do you add butter inside the oil and mix? Or pour the oil into the melted butter? Thanks. Hi, you can do either way but I prefer to add oil first before the butter as the latter burns up rather quickly so the olive oil is just an additional medium to raise the heating point (hence to prevent quick burning). Let me know how it goes when you have the chance to make this. Enjoy! Hi, would you recommend double fry if i am using the wings instead of thigh meat? Sure, that sounds good. I do double-fry my chicken sometimes to ensure max. crisp and crunch. Let me know how it goes when you’ve the chance to make these. Cheers. No hard and fast rule, you can definitely skip the butter but the overall flavour will not be as good. Is it fine without the curry leaves? I wouldn’t recommend that as curry leaves are one of the main ingredients that imparts a lovely fragrance & aroma. You can try omitting them but the outcome wouldn’t be as good. Hi, I’m glad you like the recipe. May I know what kind of brochure is that? Would appreciate if you can email me at geri@springtomorrow.com with more info. Thanks.